I remember the last time the Internet went out at my apartment. I was so annoyed and felt completely inconvenienced. It was around that same time I met someone who changed my perspective about being “inconvenienced” by not having access to Wi-Fi. The first time I met David Jessup, I was immediately taken by his easy and approachable manner, his humor, and his passion for change. 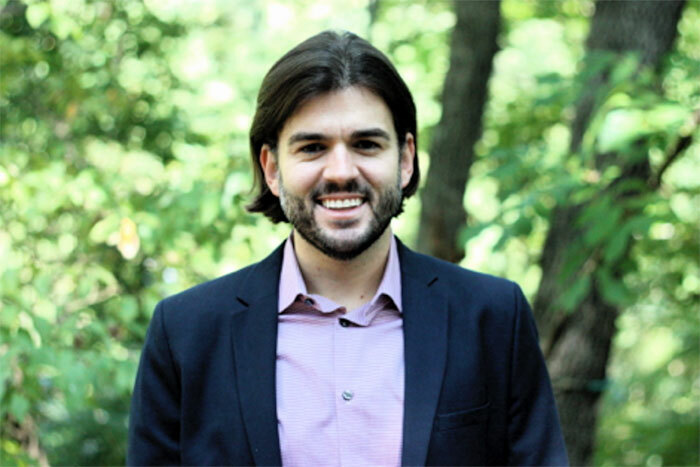 Jessup is the founder and chief executive officer for Digi-Bridge, a Charlotte-based 501(c)3 nonprofit working to bridge the gap between education and access to technology. The organization believes that the “digital divide” is a reality that is exacerbating the country’s educational achievement gap. A former Teach for America Corps member, Jessup saw first hand the disconnect (both literal and figurative) between student needs and access to resources in schools. During his experience, he realized technology was a space where change could be made in a progressive and impactful way. Digi-Bridge was founded out of this realization. Nearly 20 percent of American households lack access to the Internet. 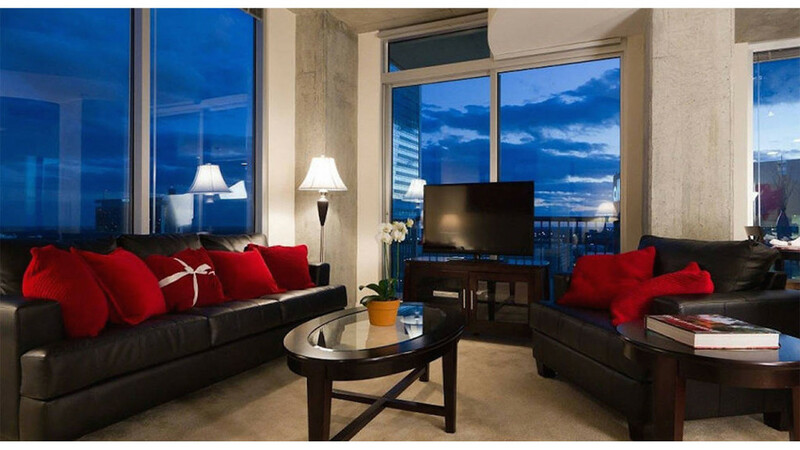 Locally, 19 percent of Charlotte households are completely disconnected. The U.S. Department of Labor predicts that in just five years, there will be three times as many computer science job openings in this country (roughly 1.4 million openings) as there will be qualified graduates to fill them. Traditional ways of teaching and learning, coupled with the issue of equity, are only placing disadvantaged students further behind. 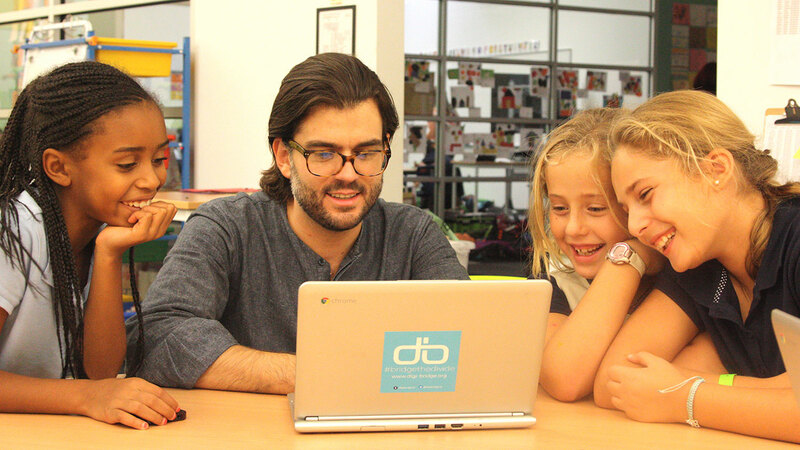 Through advocacy, consultancy, and education, Digi-Bridge strives to create a community where all children have access to the necessary technologies to obtain the best education. 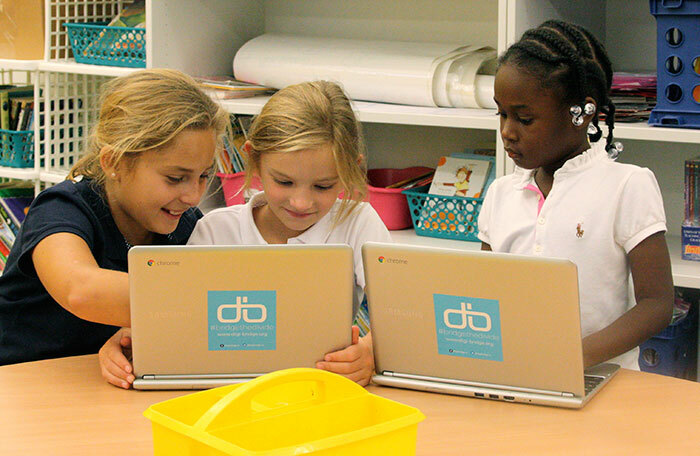 Since January, Digi-Bridge has provided 208 Charlotte students with STEAM (science, technology, engineering, arts, and mathematics) learning opportunities. 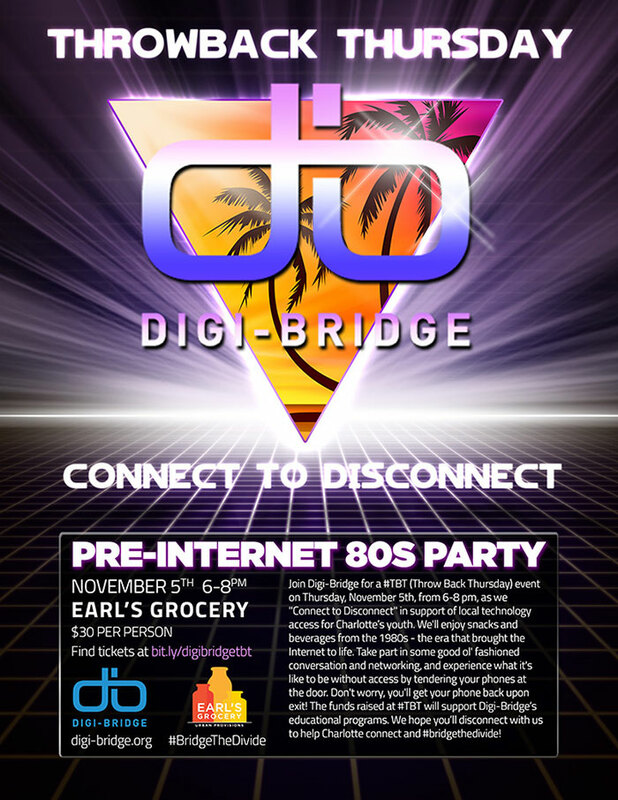 This Thursday, November 5, Digi-Bridge is hosting #TBT (Throw Back Thursday), a fundraising event to support their mission of local technology access to the students of today and tomorrow. The event will take place at Earl’s Grocery from 6 p.m. to 8 p.m. and a limited number of tickets are still available to the event. The funds raised at the event will support Digi-Bridge’s educational, technology, and camp programs. The event will be 1980’s themed and guests will be asked to “disconnect to connect” and experience what it’s like to be without access by either checking their phones at the door, or leaving their phones in their car. Checked phones will be returned when guests leave the event. I know, I for one, have taken for granted that I have access to technology and the Internet whenever I want it. Speaking with Jessup and learning about Digi-Bridge further opened my eyes to the disconnect in our community. It’s awareness that can make a difference in our life and the lives of others.